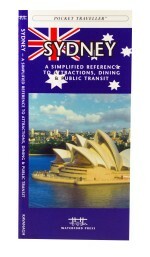 Sydney, A Simplified Reference to Attractions, Dining & Public Transit, this guide from Waterford Press provides a synopsis of the top attractions, stores, entertainment venues and transit systems of Sydney. Put the city of Sydney in your pocket! Waterford's Sydney guide highlights the essential information you need to know in a handy pocket-sized guide. 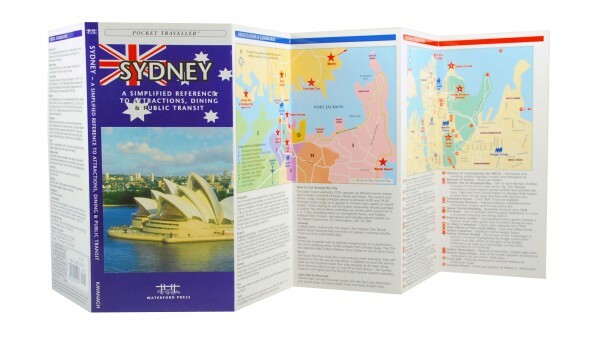 Pocket Traveller™ City guides are pocket-sized products that provide a synopsis of the top attractions, stores, entertainment venues and transit systems of the world’s greatest cities. A perfect complement to bulky book-sized guides, Pocket Traveller™ guides from Waterford Press are lightweight, easy-to-use references that are handy to carry about while sightseeing.The beauty of the City guides is that similar maps are repeated throughout the guide in the sections on attractions, dining, and things to do. This allows a visitor to easily understand where the sights, restaurants and shops are located in relation to one another. So, for example, if you are at the Opera House and want to eat in the area, you simply look at the location of the Opera House on the attractions map, flip to the dining map and find what restaurants are in the same vicinity.Getting around in the cities is simplified by encouraging the traveller to rely on a the cities most efficient method of public transit. In Sydney for instance, take the ferries or trains. The location of guide sites are noted by the ferry or train stops, so users can find their way easily around the city.